Product endorsement: Need a moisture meter? Get this one. I've been using a Protimeter Surveymaster moisture meter for the last 10 years or so, and I'm convinced that this is the best moisture meter for home inspectors, or anyone else doing similar work. I've tried many alternatives, but haven't yet found a better moisture meter. I've been meaning to do a review of different moisture meters, but people read reviews to help decide what to buy. I'm just going to come right out and say that if you're a home inspector, the Surveymaster is the moisture meter of choice. Ask a room full of home inspectors what moisture meter they use, and at least half of them will tell you this one. I've tried many different moisture meters over the years, and I haven't found a better one. Moisture meters operate two ways: either with pin-probe or scanning. Some moisture meters do one or the other, and some do both. A pin-probe moisture meter works by poking a pair of pins into a material, traditionally wood. A small electrical current is run between the pins, and the lower the resistance, the higher the number. The more basic moisture meters only have pins built into the moisture meter, while the higher-end moisture meters also have external jacks to allow for different moisture probes to be plugged into the meter. A scanning moisture meter works by sending out radio waves to detect moisture, and can be used to quickly scan large areas for moisture. The Surveymaster does both, and it has an external jack. Of all the different moisture meters I've used, the Surveymaster is by FAR the best when it comes to size and shape. It's small and slim, making it easy to slip in and out of a tool pouch. Just check out the lineup below. I'm not a fan of the new shape, but I still think it's better than all of the other ones. If a moisture meter is too large to fit into a home inspector's tool pouch, they won't have it with them at all times, and the moisture meter probably won't get used as often as it should. I've found that I'm far more likely to use a tool if I have it by my side. I don't think there's a huge difference in performance between a high-end pin-probe moisture meter and a cheap one. It's a simple device that's only as good as the person using it. If the pins are pushed into a material with an unusually low resistance, a pin-probe moisture meter will give a false high reading. If the pins don't make good contact with a wet surface or they're used on especially rotted wood, they might give a false dry reading. In the hands of the right user, any pin-probe moisture meter can do a good job. As far as I'm concerned, the most important criterion for a scanning moisture meter is responsiveness. When I use my moisture meter in scan mode, I want instant feedback. A half-second delay is unacceptable. Having instant feedback allows me to scan large areas fairly quickly, and with confidence. The only two scanning moisture meters I've used that offer instant feedback are the Surveymaster and the Tramex Moisture Encounter Plus (MEP). The Tramex MEP is an excellent non-invasive moisture meter, but it's too big and boxy to take up residence in my tool pouch, so it resides in my tool bag and it rarely sees the light of day. I occassionally use the external jack on the Surveymaster to connect my deep-wall probes to check a wall where I suspect moisture intrusion. 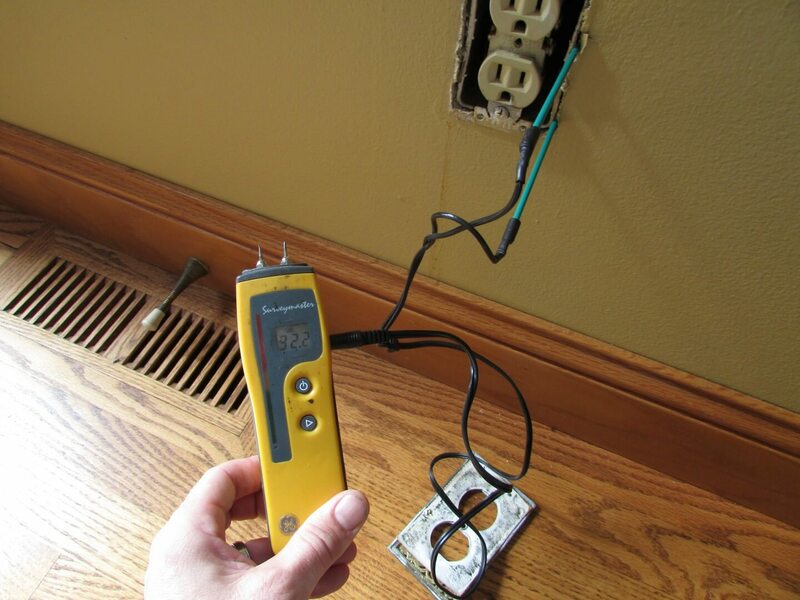 Home inspections aren't supposed to be invasive, so I can't go drilling holes in walls the way we do for moisture testing inspections, but Barry Eliason taught me a neat trick a few years ago. The deep-wall probes that are available for the Surveymaster can sometimes be used to slip through the space between an outlet box and the drywall to check for moisture at the exterior wall sheathing, as shown in the photo below. Moisture meters without external jacks simply can't do these kinds of tricks, and that eliminates a LOT of moisture meters. I've never used a moisture meter as hard as I've used my Surveymaster, so I can't say how it compares to other moisture meters, but I'd call this thing a tank. Every inspector in my company has one, and we've yet to have a single moisture meter go bad. Sometimes the metal pins get bent, but they're easy to replace. It comes with a protective cap for the pins, but I lost that a very long time ago, and it seems that lots of people lose theirs. No big deal, as far as I'm concerned. At about $475, this is one of the most expensive moisture meters available, but if you're a home inspector, this is a tool you'll be using every day. I recommend you pony up and get a tool you'll be happy with. Just for fun, here's a short compilation of video clips showing the Surveymaster in action. These are all random clips from home inspections that we've done, so there's no explanation included in the clips, but you'll probably get the idea. Red light and faster beeping typically indicates moisture. When we stick the pin probes into wood to get a moisture reading, we typically just take a photo showing the reading, but when using the scan mode, we often take videos. The last video clip shows us doing moisture testing on a home with vinyl siding. Should home inspectors ever open 'sealed' attics?